How do you print raised letters using letterpress? Letterpress is usually associated with impression but one of our favorite effects to use is a knockout in which the space around the letters is pressed in. 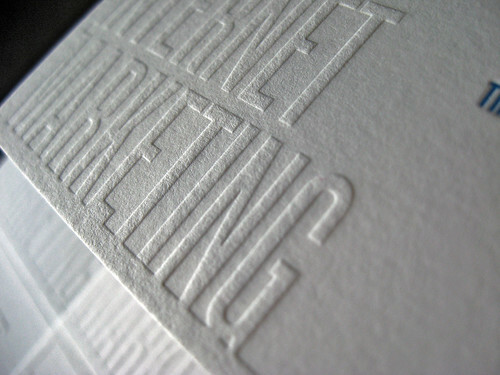 This gives the effect of raised lettering like embossing. 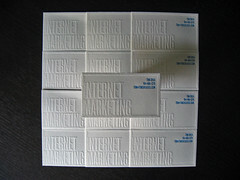 We used the knockout effect to create a unique set of business cards for Tim Shea, an Internet Marketer and SEO wizard. 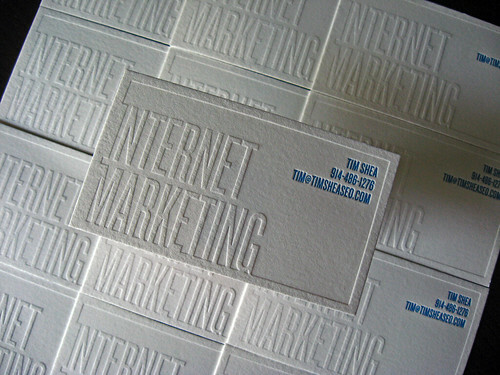 We worked with Tim to design and print a custom business card for his Internet Marketing business. Custom business card design is something we really love to do. We print a lot of business cards and seeing so many designs put on paper really helps to speed up and streamline the design process. We often refer back to previous work for inspiration on styles and effects that make a letterpress business card stand out. Andy, one of our favorite graphic designers, worked with Tim to create something unique. To see more of Andy’s work check out the post-tag: Andy Lee. The design for these cards was inspired by our 2010 letterpress holiday cards. You can see the translation of the design to paper and how different the finished look is. 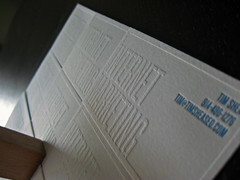 Designing for letterpress can be tough since layout is done in a 2D format but the final result is 3D. The gray in the design above was actually printed as a blind press. It’s shown as gray for contrast. If you’re submitting a file for printing make sure to note which aspects you’d like printed without color (blind). 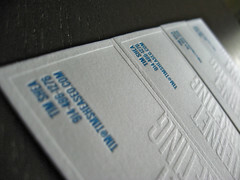 The cards were letterpress printed on 110# Crane’s Lettra in Fluorescent White. The contact information was printed in a process blue. 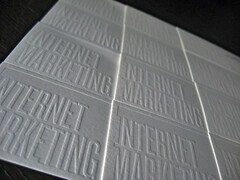 To achieve the contrast for the knockout, a deep impression was required to keep the text, “INTERNET MARKETING”, raised. After the blind knockout, the blue was printed. It was printed second so that the small text would have an impression on the paper. If we printed the colors in the opposite order, the blind impression would have erased any impression on the paper. With a small border, cutting the cards is really critical so that everything is even. If you’re looking for design help with your business collateral, contact us to get started.